Sit in your car and wait for help. Sound your horn at passing motorists. If your vehicle breaks down on the highway, you should signal before carefully exiting the roadway and turning on your hazard flashers. Get as far off the road as possible and park in a location where other drivers can easily see you. Lift your hood to let other drivers know your vehicle is disabled. An upcoming curve in the road. 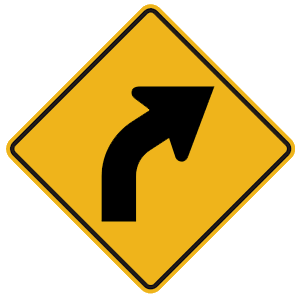 This sign indicates that the road ahead curves to the right.